This stunning scenic road is one of the most incredible and exciting roads to travel. It is also commonly known as “Highway 12 A Journey Through Time Scenic Byway” and is a designated All American Highway, and is rated among the top ten in several magazines! Winding through slot canyons, pine and aspen forests, red rocks, national and state parks, the scenery drastically changes as you travel from one end to the other. As you Travel this road you will pass through some of Utah’s most amazing, stunning and highly sought after scenery. Scenery that people travel from all over the world to get a glimpse of. 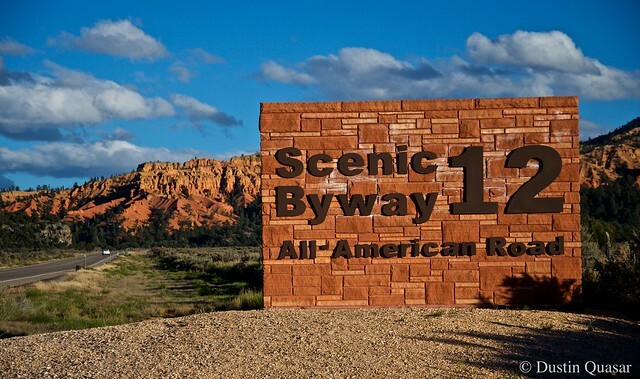 Scenic Byway twelve is a 122 mile stretch that passes through Red Canyon, Bryce Canyon, Grand Staircase, Boulder Mountain, Dixie National Forest and concludes in Capitol Reef. It’s no surprise that this is one of the top rated roadtrip highways in America. There is so much to see and do along the way that it could take travelers up to several days to complete! Now that is a roadtrip we’d like to go on!